Women are already making important contributions across all key spheres of our society. The field of engineering is one such major beneficiary. In the midst of these changes, there has always been the conundrum of harmonising the workplace with domestic demands. 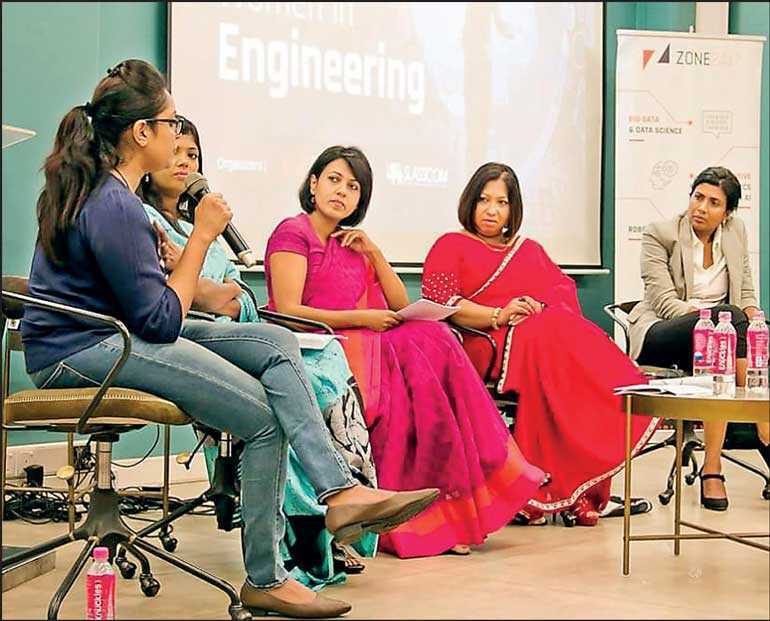 The struggles of balancing a career along with a family life by Sri Lankan women professionals in engineering was explored by a forum jointly organised by Zone24x7 and SLASSCOM recently. Five illustrious women – Loons Lab Founder and Director Pulani Ranasinghe, WSO2 Senior Technical Lead Sinthuja Rajendran, Dialog Axiata Group Customer Officer Group Service Delivery Chief Sandra De Zoysa and Virtusa HR Senior Director Chandi Dharmaratne – took part in a panel discussion; moderated by University of Colombo Human Resources and Management Professor Dr. Arosha Adikaram. Pulani Ranasinghe delivering the keynote related; how she struggled to find her niche, until one day she resigned from her job and decided to become an entrepreneur; capping that each woman is different and so is her destiny. The panel discussion began with a quote by Dr. Adikaram: “Live to work. Work to live. Live and work. Live life to the fullest.” The conflict of these priorities have always been a woman’s struggle. Chandi Dharmaratne stated that you never find a male CEO being asked the question of how he balances his work with duties to his family; because it is women who are expected to play certain roles that are reinforced by societal expectations and norms. Women have to grapple biological, emotional and psychological challenges they have no control over. Instances such as separation anxiety and distress from having to leave their child, problems with nursing and minding them could be counteracted or eased by workplace facilities. Sinthuja Rajendran stated that men simply don’t distinguish their workplace from home, sometimes preferring to work at home as well. Sandra De Zoysa commented that a woman’s success depends on her choice of life partner, as a spouse has to be flexible enough to take turns and share responsibilities; especially in the face of urgent matters. A mother’s attachment to her child and the guilt of not being there every step of the way will always conflict with her desire to dream, aspire, to create and cause waves in the world. As a working person, she becomes a role model to her children, and shows them how life can be lived while juggling various roles. The event saw over 100 participants, and many eagerly shared their own experiences as well, signifying the need for this dialogue to continue.